Energy Industry Experts Give Students Insight to Shale Gas Impact on U.S.
(From left), Jay Painter, Engineering Manager for New Product Development at Cameron, and Brian Matusek, vice president of Business Development at Cameron spoke to students on Feb. 13 about shale gas and its impact on U.S. energy. 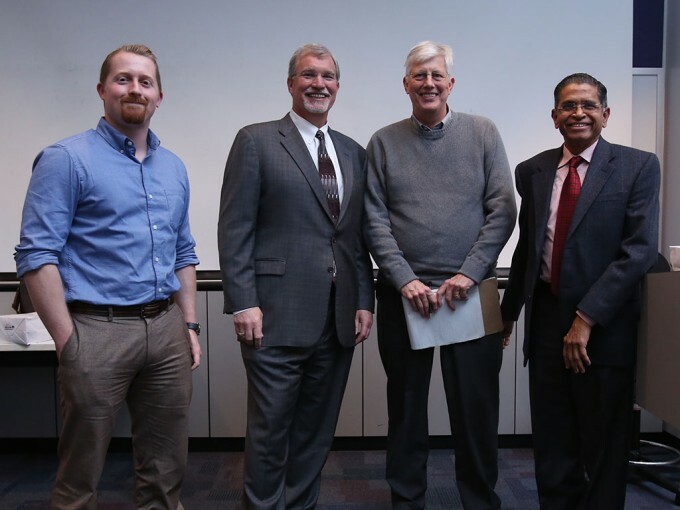 Joe Pratt, Ph.D., Cullen professor of History and Business at the University of Houston C. T. Bauer College of Business, (center right) and Radha Radhakrishnan, clinical assistant professor for Decision & Information Sciences, hosted the discussion. 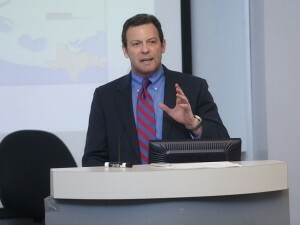 Senior Vice President for Cheniere Energy, Inc. Keith Teague, talked to students on March 6 on the challenges facing LNG. Students from the C. T. Bauer College of Business will have the opportunity this week to lend their voices to a hotbed of discussion on emerging issues in the energy industry that has been brewing in one of their classes this semester. On Friday, March 29, student teams will argue for or against the export of natural gas as part of Assistant Professor Radha Radhakrishnan’s Energy Supply Chain course. The debate comes as the conclusion of several presentations over the past two months from professionals working in the energy industry. Radhakrishnan, himself a 36-year veteran of the industry, has opened his classroom to members of the campus community during these talks, which have featured different perspectives on shale, liquefied natural gas (LNG) and the global picture. On Feb. 13, Cameron employees Brian Matusek, vice president of Business Development, and Jay Painter, engineering manager of New Product Development, discussed the impact shale gas has on the U.S. from their perspective, working for a produce and service provider. 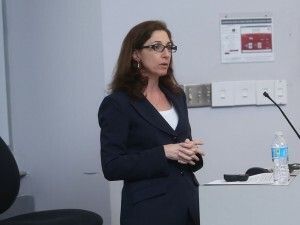 Susan Sakmar, visiting assistant professor and Andrews Kurth Energy Law Scholar for the University of Houston Law Center, talked about the regulatory and policy issues of U.S. LNG exports. On March 6, Radhakrishnan hosted Keith Teague, senior vice president for Cheniere Energy, Inc., for a discussion about a new era for liquefied natural gas and the challenges it faces, and Susan Sakmar, visiting assistant professor, Andrews Kurth Energy Law Scholar at the University of Houston Law Center, for a discussion on regulatory and policy issues LNG exports face. The goal of bringing these speakers to class, Radhakrishnan said, is to provide students with opinions on subject matter that can’t be found in a textbook because it is still being debated. Capping off the series of talks with an in-class debate will allow the students to apply the knowledge they have gained over the past few weeks, he added.